If you are looking for a great flat stomach exercise, look no further. 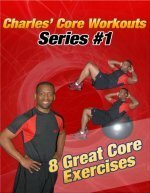 This page has pictures of a great oblique and lower stomach exercise using a stability ball. The Stability Ball is a great tool for stomach workouts and you can use it in so many ways to strengthen your stomach and oblique muscles. There are so many awesome stomach exercises you can do using a Stability Ball. Below are pictures of pendulums utilizing a Stability Ball. Starting Position: While lying on your back, place a stability ball between your feet. Do your best to keep your legs straight and your feet pointing towards the ceiling. Place your arms out to the side for support. Form: Inhale and slowly lower your legs to one side until your feel a good stretch in your oblique muscles. Move only as far as you can control your lower back, and when you reach that point, reverse directions and then lower your legs to the other side. Personal Trainer Tips: Use a comfortable range of motion. The closer your feet move towards the floor the more challenging this exercise is for the stomach muscles and the lower back muscles. This exercise can place a lot of tension on the lower back, so be very mindful of how your lower back feels throughout. If you have difficulty keeping your legs straight when you hold the ball between your feet, it may be a sign of tight hamstrings (the muscles on the back of your thigh). If you have tight muscles, add some hamstring stretches to your workout. The stability ball can make your stomach workouts more fun and more challenging, so incorporate a stability in your workout whenever you can. Visit the Picture Directory of Abdominal and Stomach Exercises to find a flat stomach exercise for your workout or try one of the free stomach workouts on this site. Lastly, read about how get a toned flat stomach and read about the #1 Stomach Exercise Myth.